Great Lakes Seiwa Kai in the only dojo in this area of the United States that is a member of both the USA National Karatedo Federation (the official governing body for all Karatedo in the U.S.) and the Japan Karatedo Federation (the official governing body for all Karatedo in Japan and Okinawa). Sensei Mark Cramer began his karate-do training in 1971, and began training in Goju Ryu in 1974. He is a member of the Seiwa Kai where he is a 6th degree black belt (Roku-dan). He is also a 6th degree black belt in the USA National Karate-do Federation (USANKF), and a 5th degree black belt (Go-dan) in the Japan Karate-do Federation (JKF) Goju Kai. Sensei Cramer has trained at the JKF Headquarters in Tokyo, Japan and the Seiwa Kai Headquarters in Omagari, Japan. For nearly forty years, he has taught traditional Japanese karate-do in several public school systems in the Greater Toledo area, and has trained many individuals to the black belt level and beyond. 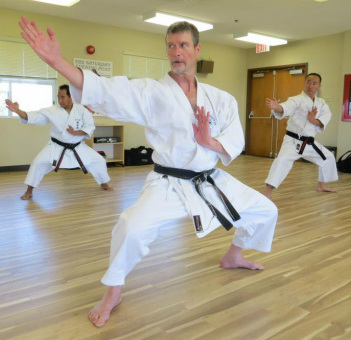 Additionally, Mr. Cramer has had a long involvement with sport karate-do, and has competed in kata (forms), kumite (sparring), and kobudo (weapons) divisions in the United States, Canada, and Japan. In over 40 years of training and competing he has won many awards, including more than twenty national medals and nine national championships in tournaments sanctioned by the U.S. Olympic Committee's National Governing Body for Sport Karate-do.